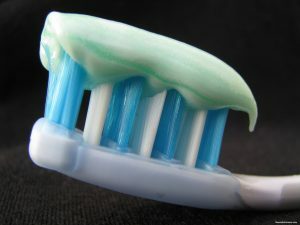 Anti-cavity: Toothpaste with this feature contain fluoride. Fluoride is designed to prevent decay and improve the strength of the enamel of the teeth. Tartar-control: Toothpaste with tartar-control will prevent the buildup and hardening of plaque. Whitening: The whitening toothpaste is designed to remove stains from the surface of the tooth. Whitening toothpaste can aid in helping teeth to look whiter and not as yellow or brownish in color. Organic toothpastes are created with several natural ingredients. Dr. Bronner’s All One Toothpaste is made with 70% organic ingredients. Dr. Bronner’s toothpaste does not include synthetic detergent foaming detergents. This toothpaste is designed to properly clean your teeth, gums, and mouth without causing burning pain that is common with other toothpastes. This can be a great option if your child has sensitive teeth. Another organic toothpaste made without fluoride is Happy Teeth toothpaste. This toothpaste is designed to clean your mouth to remove bacteria without leaving behind harmful agents that increase the likelihood of cavities and gum disease. One of the most common brands of toothpaste on the market is Crest. Most types of Crest toothpastes on the market include fluoride, but there are some new organic toothpastes on the market that only use natural ingredients to remove plaque and bacteria from the mouth. Crest does have multiple types of toothpaste targeted at different oral health needs from teeth whitening to gingivitis. In close competition with Crest is Colgate. Colgate brand toothpaste has been on the market since 1873 and remains a billion-dollar toothpaste brand. Colgate toothpaste has several versions available including toothpaste for sensitive teeth and others for teeth whitening. Colgate has also created all-natural toothpaste for individuals that do not want toothpaste with fluoride and other chemicals. Using baking soda as one of the main ingredients, Arm and Hammer toothpaste is one of the leading brands for its multi-specialty toothpaste. The combination of baking soda and peroxide in the toothpaste aids in fighting bacteria that causes canker sores, gum disease, and a handful of other oral health issues. We hope this small guide will help you find the right toothpaste for your child’s oral health needs. If you have more specific questions about toothpaste, or are looking for a Pediatric Dentist in Columbus, OH then contact us to schedule an appointment.